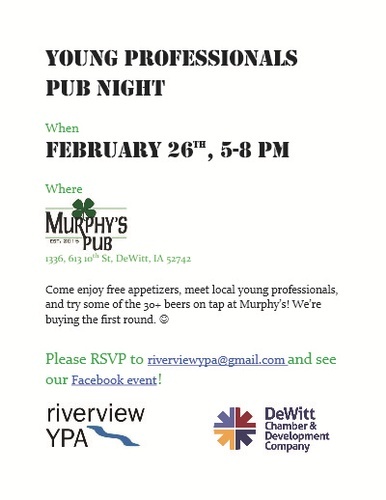 Bring a stack of business cards, escape the cold and head over to Murphy's Pub for an event every Young Professional would want to attend! From 5-8 on February 26th, drop in and join other Young Professionals (YPs) in your area for a few drinks and some fun appetizers! Hosted by the Riverview Young Professionals Association (RYPA) and the DeWitt Chamber & Development Company (DCDC)! This is the perfect networking event to get you out of the house and meeting new people from DeWitt, Clinton and the Quad City areas! This event is intended for anyone 40 or under but anyone is welcome to join us! Enjoy two free drinks and appetizers on the RYPA and expect to network in a casual environment! This is a FREE event so tell your friends!